Firstly, make sure you know the difference between a powered wheelchair and a mobility scooter. A powered wheelchair has separate motors for the left and right wheels, whereas a mobility scooter will have only one motor for both wheels, and won't be suitable for a differential drive robot. Make sure the wheelchair works. There should not be excessive slack in the motors. Standing in front of the chair and making sure it pushed hard against a foot is a good test. A battery charger is essential. Getting the original battery charger for the chair (intact and working) is good. Buying one will be expensive, and more awkward. If a chair doesn't go well, it could be the batteries. Replacing batteries will be a major portion of the total cost. Every vendor will say 'it has (almost) new batteries, mate'. A healthy level of scepticism is advised. Some wheelchairs actually have water-resistant battery cases for the batteries. These are great for rough or wet terrain. Wheelchairs are very expensive when they are new - ie thousands of dollars. People have trouble understanding that grandma's expensive wheelchair is now worth only a few hundred dollars. One common pattern is that they don't know how to look after the lead-acid batteries. Lead-acid batteries should be kept topped up to full when they are not being used. People often don't know this and think they are 'resting' the batteries by letting them go slowly flat, and permamently damage them by doing so. Then, potential buyers who test the wheel chair know something is wrong (they lack power), and don't want to buy them, which frustrates the seller, and neither knows what the actual problem is. 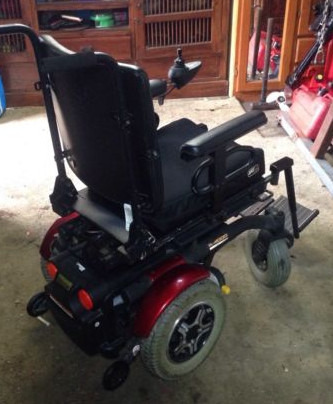 Hence it is possible to pick up a cheap wheelchair by waiting until a chair is unsold for a while, and letting the price settle before making an enquiry. Unless the chair is in really bad condition, it may be best to avoid mentioning to the vendor that the chair is being re-purposed for robotics. Many people like to think that their late Grandma's chair will be used for a cause they would consider more noble. Understanding that a healthy market for re-purposing second-hand wheelchairs lowers the total cost of ownership for newer chairs (for those who really need them) involves an understanding of economics which is is beyond most people. Sometimes it's best to smile and say nothing. There are lots of smart and experienced people who have made YouTube videos of this, and they do it by fluxing everything in sight, and then letting solder wick up into the connector. 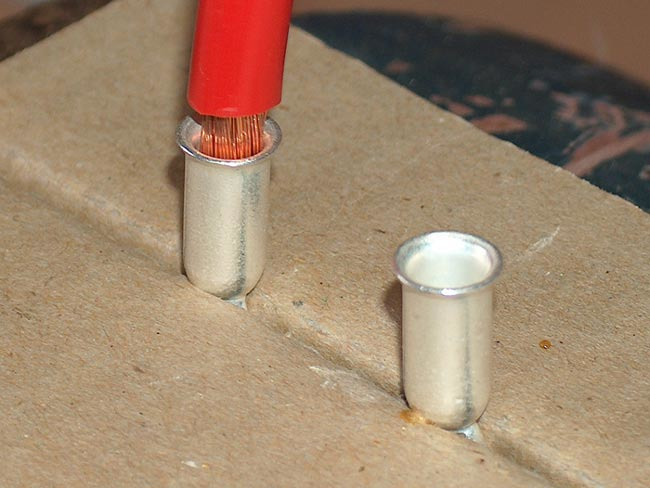 This is great if you are a good solderer, but the easiest way is to hold the connector plug-down, put the wire into the top, and let the solder run into it like a container. It might require three hands. Or a teenager. Or a vice. This box is around $30 from Jaycar. 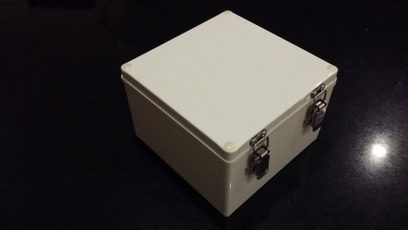 It's really good - has has hinges clips, and is high enough to mount components on the sides as well as the bottom and top. 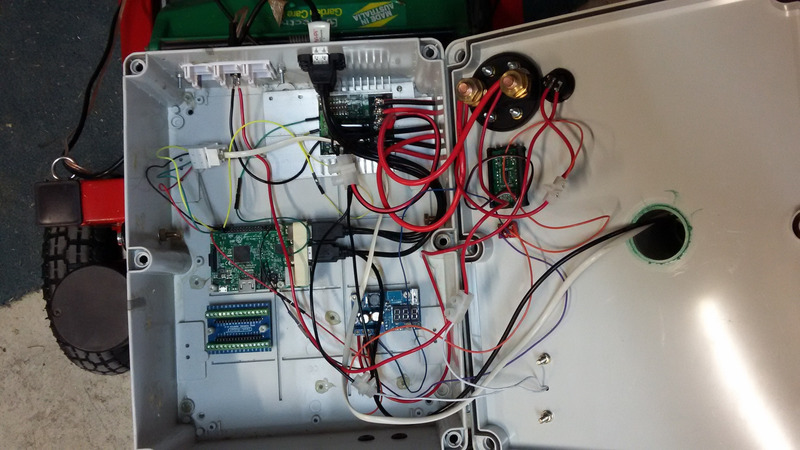 This is the control box for GizMow It was reused from another old project, and therefore free. But the Jaycar one above would have been better. You need a big button to run up to and press when things go wrong. The Emergency Stop button in the first version of this project was a Jaycar cheapie with a very low current rating which just pulled the S2 line into the Sabertooth down to 0V, telling it to stop. This mechanism allowed the use of a cheap (Jaycar) latching button with a very low current rating, but this had significant problems. A proper safety button will remove all power to the motor controller - not politely request the Sabertooth motor to stop. This new (and much more expensive) high current Emergency Button was installed. Normally a Raspberry Pi is powered by the micro-USB port, from a computer or something like a phone charger. When USB devices hung off the Pi, they get powered via the same cable. If the total current use goes above about 700mA, the poly-fuse blows, and the Pi crashes. However, 5V can be applied directly to the GPIO block, which bypasses the poly-fuse, and sends power directly to both the RPi and to the USB devices. There is no longer any protection for the Pi, but it can power many USB devices. This project used a WiFi access point on the peak of the homestead roof, which in theory can be seen all over the farm. However it is pushing the range limits of WiFi, hence a quality (high gain) WiFi dongle was used. Back-powering the Raspberry Pi through the GPIO block seemed to help, and cause less drop outs.